Allow a transition phase, adjust amounts and divide it into meals according to your pet's needs. Visit our website or call our Consumer Careline for feeding information. Fresh water should always be available. Serve food at room temperature, surplus food can be chilled for up to 2 days. Succulent Selection in Gravy is rated 1.0 out of 5 by 1. 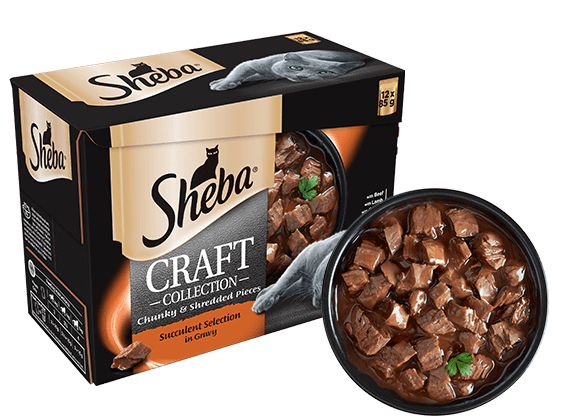 Rated 1 out of 5 by nobby from My cat will not even try it My male Bengal cat has been a regular enjoyer of Sheba cat food . We thought we'd try him on the new Craft selection for a change. After an in-depth sniffing of one of the first pouches out of the packet he refused to even try this new collection. we have tried again with another flavour from the same packet but he turned his nose up to this as well. The only other time he has refused to even try something has been when we have tried to offer him some cheap food or a supermarket own brand.. You seem to have a problem with this product as far as our cat is concerned please can we go back to the old recipe Shumba is 10 years old and weighs in at six and half kilos although he is not overweight at all and is an outside cat. Spending a large majority of his time out in the open and down in the woods. Therefore has a fairly healthy appetite.